The pressure is on for jugglers to secure their places for the European Masters tournament on the 5th of December. 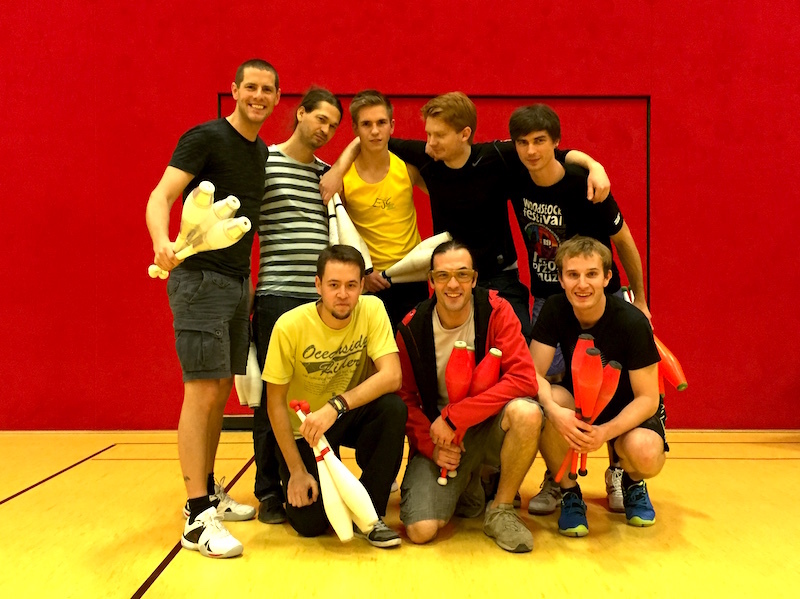 With only two remaining tournaments in Germany, a number of players traveled over to the Cottbus Juggling Convention, specifically to take part in the Fight Night, organized by Stefan Schmidt. Florian Marienfeld and Alexander Müller already had enough points to end the year inside the top 10, but neither had the minimum number of tournaments needed to get an invite to the European Masters. Meanwhile, Jochen Hänsel would have needed a 4th place finish to overtake Brook Roberts. And Stephan Cipra spent four hours traveling from Hannover to try to secure some "easy" rankings points at a small tournament, not knowing so many other players ranked above his 24th place would also turn up. To make the tournament harder for those with rankings ambitions, former top 10 player Rufus Oelkers and current number one Luke Burrage also made the trip down from Berlin. In the end, Jochen only improved his rankings points haul by 12 points, as he was knocked out in the round of 8 by Flo, and Stephan didn't match his previous 3rd and 2nd place finishes at 250 and 125 tournaments in 2015, so failed to add any rankings points. However, in 2016 all players will have an extra tournament count towards their rankings points, seven tournaments instead of six, so their participation at Cottbus will be rewarded in the new year. A total of 17 jugglers took part in the qualifications, and the top eight reached the knockout. The top four seeds made it through to the semi-finals. Luke beat Rufus 5-1, and in a replay of the third place match in Hamburg, Flo faced off against Alex. The result was the same, with Flo the more consistent player, and Flo won 5-3. Alex went on to take third place, beating Rufus 5-3. The European Masters provisional invite list has been updated. Simon À Campo is now in 10th place. Technically he could be passed by a number of players, though his main threats are Jochen Hänsel (needs a 2nd place finish in Nürnberg to pass Simon) and Julius Preu (needs to win in Nürnberg to pass Simon). But at least one of the top 10 players might not be able to make it to the European Finals, so the the top player with at least three tournaments outside of the top 10 might still get a stand-by invite. Despite all the action in Cottbus, it still looks like it will all be decided in Nürnburg!